The first is a floral using a tonal colour scheme featuring the scrumptious new Rich Razzleberry which goes so beautifully with pale plum. 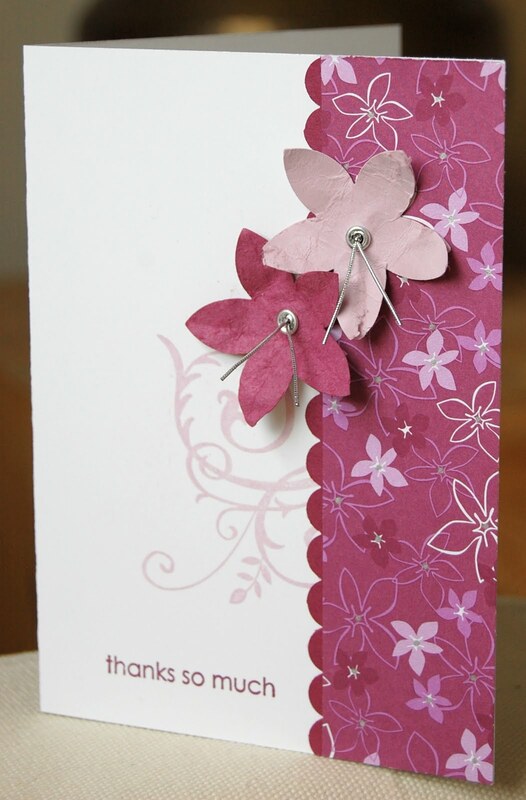 I used the 5 petal punch to make the focal flowers because I liked the way they echoed the shape of the flowers in the paper. I set an eyelet in the centre of each flower and threaded a knotted piece of silver cord through to represent stamens. The next card is for a smaller person! It's a window card using the cute lion from Fox and Friends. I thought this swirly design in the Cottage Wall designer paper looked quite junge-lish. It's adhered to the card front and the window is cut out with the 1 3/4" circle punch. I heat embossed the lion and made a little scene for him using daubers and ink and a leaf stamp from Pocket Silhouettes. I punched it out with the same circle punch and adhered it inside the card so that you can see it through the window on the front. 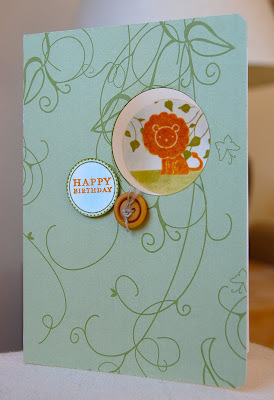 To finish the card, I added a heat embossed happy birthday tag and a matching button and rounded the corners. Here's how it looks when it stands up. Can you see that properly? So there we have it - two completely different looks from the designer paper. And it certainly doesn't stop there! Do come back to my blog in the coming week to see more ideas using the Cottage Wall papers. Love the cards Vicky expecially the Lion! my favourite set of stamps ever! Eeek! That lion card is wonderful! How did you ever think to use the Pocket Silhouette leaves like that?! I'm so impressed, Vicky! And what a great idea to showcase the pack of dp with two very different types of cards. I have this urge to comment on every card you've made since I was last here.. they're all so pretty! This one - what fabulous swirly leaves! And I love peek-a-boo cards. That little lion is so cute. Oooh.. ok I wasn't finished, apparently. That raspberry and white flower card.. so precious! The cord through the eyelets is such a great idea! And I love how those flowers perfectly echo the flowers on the paper.